The Collaborative Worldbuilding Deck is the first of three decks designed to teach storytelling fundamentals. The Character Building Deck and Storybuilding Deck are both in advanced prototype stages and both have been well-received by playtesters. There will be a Kickstarter campaign in early 2019 to generate funds to complete the decks with professional quality design and artwork. Participants begin by using the Collaborative Worldbuilding Deck to generate a random world and discuss how to interpret the category values. Through these discussions, they develop a narrative that explains the most prominent features of the world. 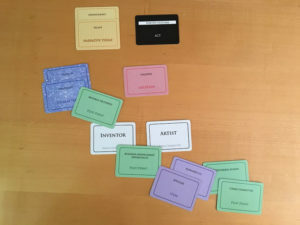 Once they have a firm understanding of their world and points of social tension, the participants then use the Character Deck to generate three random characters, complete with archetypes, positive traits, negative traits, motivations, and aspects that connect them to the world that has just been built. Each new Character also has a relationship with the other two. The participants first discuss how each of the three Characters fits into the world, and then they consider the nature of the relationships that link the characters together. Finally, they decide what kinds of problems or situations the trio of Characters would face in their created world. Once the participants have an interesting world and three characters who have strong connections both to the world and to each other, the Storybuilding Deck provides a wealth of storytelling material for the participants to construct an original story. Each person receives cards for a number of Locations, Non-Player Characters, Items, and Plot Points that they can place in each scene. The play proceeds over five acts, beginning with an inciting incident, continuing through two acts of rising action, a climax, and a conclusion that work toward a randomly dealt pair of themes. 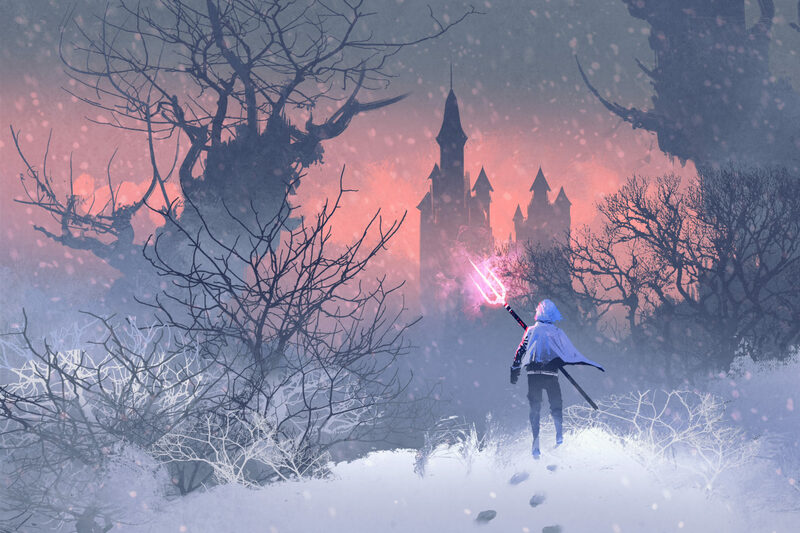 As a collaborative and cooperative game, players assemble one-act scenes by setting the Location and piecing together Characters with relevant Plot Points and Items that help move the story forward. Unlike the all-purpose Worldbuilding Deck and Character Deck, the Storybuilding Deck is based on a specific type of genre fiction. 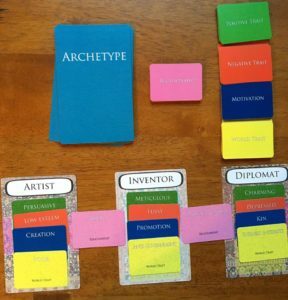 The first prototype currently being playtested is epic fantasy, but future Storytelling Decks could be in any of a number of different genres of science fiction, fantasy, and horror: steampunk, cyberpunk, post-apocalypse, urban fantasy, cosmic horror, deep space, and more. Subscribe to Cornerstones: The Worldbuilding Blog and check this site frequently for updates on the Storybuilding System and news about the Kickstarter campaign.